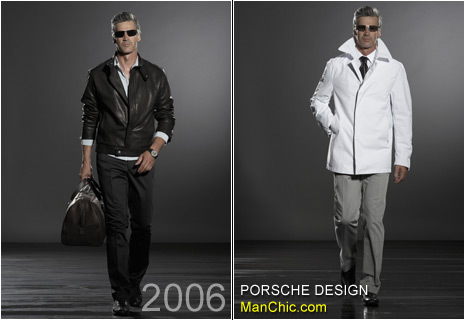 On June 26, 2006, during the Milan Fashion Week, Porsche Design presents their first men’s collection for spring/summer 2007. Exclusive licenced partnerships include renowned companies such as: Belfe for fashion sportswear and outerwear, Ferragamo for shoes and leather goods, Mantero for ties and silk accessories and Muller & Meirer for ‘Soft Luggage’. The Porsche Design Collection blends a unique, sophisticated deconstructed formal style with casual chic utilizing precious materials, innovative technological finishing and exquisite workmanship.